Those reviews highlight all the great things there are about working with Junk King Palm Beach. This is the company that likes to respond quickly to a request. As long as you made the commitment to get rid of your junk, they want to make the commitment to help you as soon as possible. If you’re ready to get rid of all your unwanted clutter, then you’re ready to call Junk King Palm Beach. You’ll be adding your own rave review. too! This entry was posted in junk removal and tagged Junk King, junk removal on October 31, 2016 by Dave Archer. Last updated August 11, 2017 . Would you intentionally spend the night in a haunted house? There are actually several bed and breakfast inns and hotels that actively advertise as being haunted. Obviously, they are going to do most of the business around Halloween but there’s just as many folks who want to get scared at “things that go bump in the night” throughout the rest of the year. Around your own neighborhood, you might notice a few pretend haunted houses as everyone gets into the Halloween spirit. Your own home might look haunted but purely by accident. If the clutter and debris you have piled up around your backyard and garage is getting too scary, then it’s time to bring in Junk King Palm Beach. Junk King Palm Beach is part of a chain of professional junk haulers that stretch from Florida all the way to California and up into Canada. 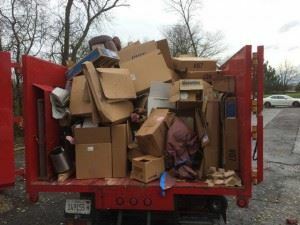 This is a business that has been dedicated to providing quality junk removal at affordable prices for over 10 years. Although they might be relatively new to the Palm Beach area, Junk King has perfected their business model. Every franchise needs to adhere to strict standards in order for it to carry the trusted Junk King brand. That certainly is a problem for Junk King Palm Beach as they’ve already excelled at providing exceptional junk removal service. Junk King Palm Beach also is happy to follow junk King’s eco-friendly disposal policy. That dictates that the majority what’s collected should be recycled or donated to charities. Because of their efforts, Junk King has managed to keep literally tons of rubbish out of local landfills. Nowhere is that more important than right here in Palm Beach. People move here for the beautiful scenery and that should never be put in peril by junk. When you’re ready to get the junk from your property, you only need to call Junk King Palm Beach. Depending upon when you call you might even benefit from the same day pick up. Although you live with his junk for some time it could be gone in a matter of minutes! There is nothing scary about the way Junk King Palm Beach removes your unwanted clutter! Treat yourself to a junk removal session today. This entry was posted in junk removal and tagged Junk King, junk removal, Palm Beach on October 23, 2016 by Dave Archer. Last updated August 11, 2017 .